This graphic outlines the novel method that allows composites to self-heal at sub-zero temperatures. Image: University of Birmingham. A team of scientists from the UK, China and the Netherlands has developed a method for allowing materials commonly used in aircraft and satellites to self-heal cracks at temperatures well below freezing. Described in a paper in Royal Society Open Science, this is the first study to show that self-healing materials can be manipulated to operate at very low temperatures (-60°C). According to the scientists, this method could be applied to fiber-reinforced materials used in situations where repair or replacement is challenging, such as offshore wind turbines, or even ‘impossible’, such as aircraft and satellites during flight. Self-healing composites are able to restore their properties automatically, when needing repair. Under favorable conditions, composites have yielded impressive healing efficiencies. Indeed, previous research efforts have resulted in healing efficiencies above 100%, providing the healed material with even better functionality or performance than it possessed prior to damage. However, until this paper, healing was deemed insufficient in adverse conditions, such as very low temperatures. To produce materials that can self-heal at these low temperatures, the scientists realized they needed to a way to maintain a material’s core temperature. So they tried embedding three-dimensional hollow vessels, for delivering and releasing the healing agents, and a porous conductive element, for providing internal heating and defrosting where needed, into a composite material. 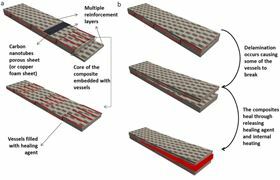 Using this method, the scientists were able to achieve a healing efficiency of over 100% at temperatures of -60°C in a glass fiber-reinforced laminate, but the same technique could be applied to many other composite materials as well. They ran tests using both a copper foam sheet and a carbon nanotube sheet as the conductive layer, finding that composites containing carbon nanotube sheets self-healed more effectively, with an average recovery of 107.7% in fracture energy and 96.22% in peak load. This meant the healed fiber-reinforced composite had higher interlaminar properties, or the bonding quality between layers. The higher those properties, the less likely it is that cracks will occur in future. The group will now look to eliminate the negative effects that heating elements can have on peak load, by using a more advanced heating layer. Their ultimate goal is to develop new healing mechanisms for composites that allow them to recover effectively regardless of fault size in any environmental conditions. This story is adapted from material from the University of Birmingham, with editorial changes made by Materials Today. The views expressed in this article do not necessarily represent those of Elsevier. Link to original source.